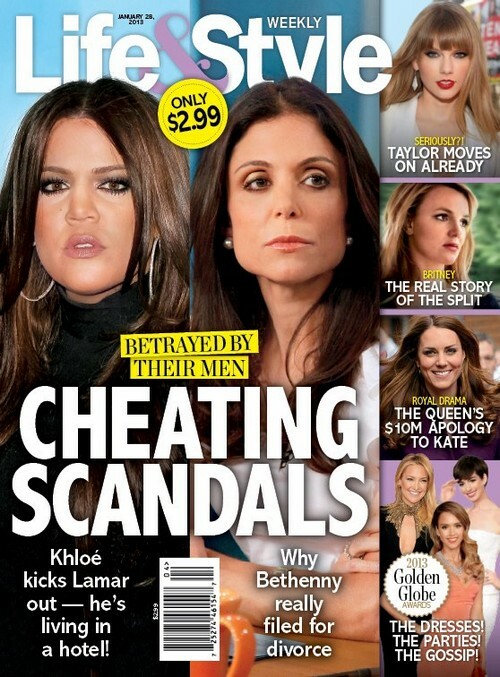 The current issue of Life & Style magazine features the bombshell story, “Khloe and Bethenny Betrayed By Their Men.” The magazine claims both Khloe Kardashian and Bethenny Frankel were involved in cheating scandals. They have have all the details on why Bethenny filed for divorce from Jason Hoppy and how Lamar Odom is living in a hotel. The magazine alludes to the fact that Bethenny’s marriage ended because of a cheating scandal. Bethenny took a week long vacation to Hong Kong with her friend Warren Lichtenstein in October 2012 — just months before announcing her split. Although it was suspected she might be having an affair, Bethenny claims that she and Warren are just friends. When Bethenny decided to vacation with Warren her hubby Jason went nuts and that may have been the final straw in their marriage. hmmm, you know what they say, where there is smoke there is fire. Looks like Bethenny has her next man all lined up. To find out all the details of Bethenny and Khloe being betrayed, pick up the current issue of In Touch!